Degrading the culture is not a tough job for Vijay TV. One side Serial are doing that job perfectly in competition to that reality shows also does their best to degrade the culture. Only a few shows like ” Neeya Naana ?” and ” Oru Varthai Oru Latcham ” are of good standards. This show Connection even though its a kind of interesting , the host Jegan spoils it by using double meaning words while hosting.His Talks are always abusive in nature.In addition to this he damages the ladies/girls who come for the show in a cheap manner. Recently he said a junior female artist who came for the show that she has drinking habits . In the latest show she portrayed the North East Girls in a cheap manner and this caused a big issue. 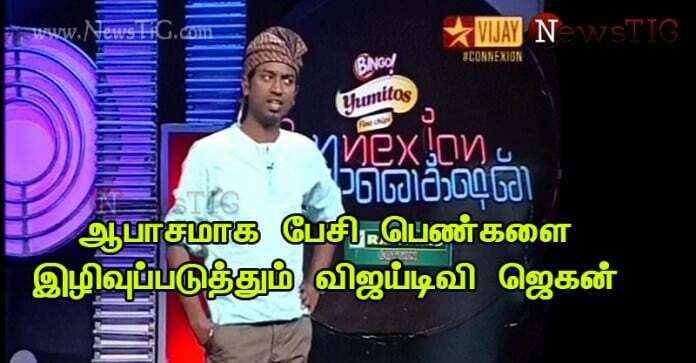 Vijay TV themselves apologized for that in the same show. Jegan must be careful before leaving his words !